The best craft cocktails are miniature works of ephemeral art. Here today, gone to stomach. This retro-style tiki bar looks and feels like a mid-century living room. Fruity cocktails served in glasses that look like skulls, tiki gods, and flaming seashells are the specialty. At $27, the Scorpion Bowl with seven ounces of rum and VSOP is your best entertainment value — especially if more than two people are drinking. Those not into tropical drinks can get classic Mad Men–style cocktails that come with a two-ounce pour. Old school-style steakhouse serves up classic martinis without pretension or fuss. The Bombay Dirty is the city’s best vodka martini even without the blue-cheese-stuffed olives. The Mission Beach Paloma is a tasty variation of a classic Margarita with Cazadores reposada tequila and grapefruit juice among the ingredients. High atop the Hotel La Jolla, Cusp offers incredible ocean views in the daytime and a free champagne toast at sunset. Great place to look for the green flash. Specialty drinks change seasonally, but all utilize fresh ingredients, housemade syrups, and artisan liquors. Balance is the guiding philosophy. July’s cocktail list includes the Pirate’s Booty, a tangy cocktail that includes spiced Caruso rum, housemade plum syrup, lime juice, and a Lost Abbey Belgian-style beer. Arguably San Diego’s hottest new restaurant. Jen Queen’s cocktails are made to be paired with Richard Blais’s menu items. Lots of dialogue between the kitchen and the bar leads to innovations such as Queen’s special orgeat syrup, made with corn, not almonds. Recommended for sophisticated hot-weather cocktails. The Drunk In Love is a fruity watermelon-and-gin cocktail that goes down like punch — and hits you like one a few seconds later. Formerly a high-quality taco shop, the La Jolla location recently added a bar area and a cocktail list that includes most of the city’s finest mezcal and tequila cocktails. The Puesto Perfect Margarita is as close to a classic Margarita as you will find in the city. The Burro Blanco is a quenching variation of the Moscow Mule with tequila blanco instead of vodka. La Verdad, made with cactus juice and tequila blanco goes down much smoother than an actual piece of cactus. Prepkitchen’s upstairs setting feels like a saloon from the city’s early days — but with a lot more single females. Bartender Adam Lockridge does fantastic riffs on classic cocktails but doesn’t mess around with the Sazerac because he “wants people to learn and love the drink the right way.” Multi-dimensional potables are the key. La Pharmacia starts off fruity until aromas of smoked mezcal take over. Likewise, the Fields of Italy has a strawberry flavor followed by the rosemary-like flavor of Aperol. This casual pub set between Point Loma and Ocean Beach hides some serious cocktailing. Serving up great variations on the Sazerac, where it really shines is warm-weather cocktails, like the Gin Fizz. With Aperol, lemon juice, and champagne, it tastes light, packs a wallop. Likewise, Sessions’ Margarita tribute, the Tequila Smash, mixes tequila and sloe gin with citrus juice for a cool drink with a pleasant burn going down. For a hotel bar, JSix gets lots of locals coming in for clever updates on cocktail classics. The Old Fashioned variation — called the Big Sky — combines rye with cinnamon-bacon cayenne and orange and angostura bitters for a spicy cocktail that, unlike most Old Fashioneds, seems appropriate before 9 p.m. The Hola Y’All is a spicy riff on the Margarita with mezcal and a house-infused vodka using the chef’s BBQ rub. 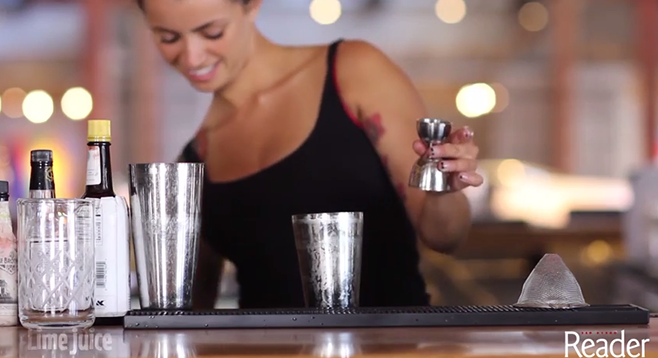 You will feel like the bartenders know your name — or at least your drink. Inside Saltbox’s dark film noir–inspired interior is a place where cutting-edge cocktails are made. Bartenders are very passionate about unique cocktail creations like the Smooth Operator (Belvedere vodka, luxardo maraschino, lime, aperol, and peach bitters) but happily make straight gin and tonics without sneering. The mixologists love emphasizing local flavors. Case in point: the Pachuca Sunrise, a new tequila sunrise variation, with grapefruit, lime, and pink peppercorns from the Peruvian pepper trees that are commonly found around East County (but rarely used culinarily). Bertrand has the best view in town, and some of the city’s classiest classic cocktails. The Thai Gimlet adds serrano pepper–infused mango and a fresh basil leaf to the vodka and lime to brilliant effect. The Dreams of Green Martini combines Hendricks gin with cucumber, basil, and lime, and the result is greater than the sum of its parts. Bartenders not only know the history of the cocktails they’re making, but why Ian Fleming made James Bond flout convention by ordering martinis shaken, not stirred. Ambiance ranges from rich and successful regulars to families on a big splurge.